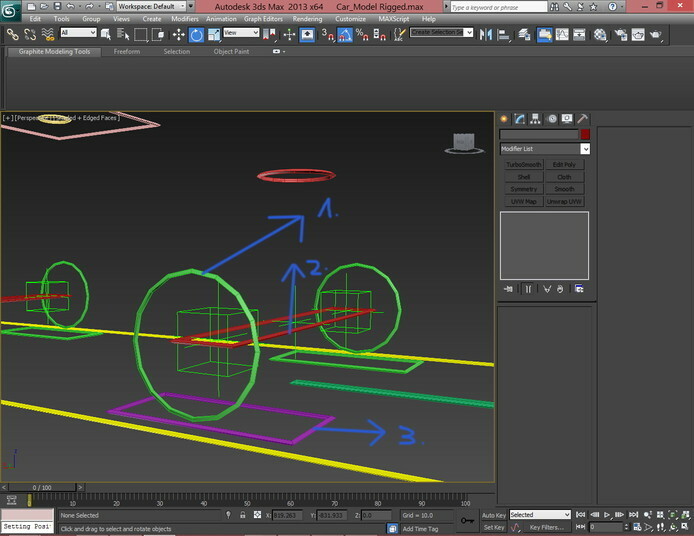 Rigging 3ds Max models consists of preparing the moveable parts of the objects so they can be animated together. 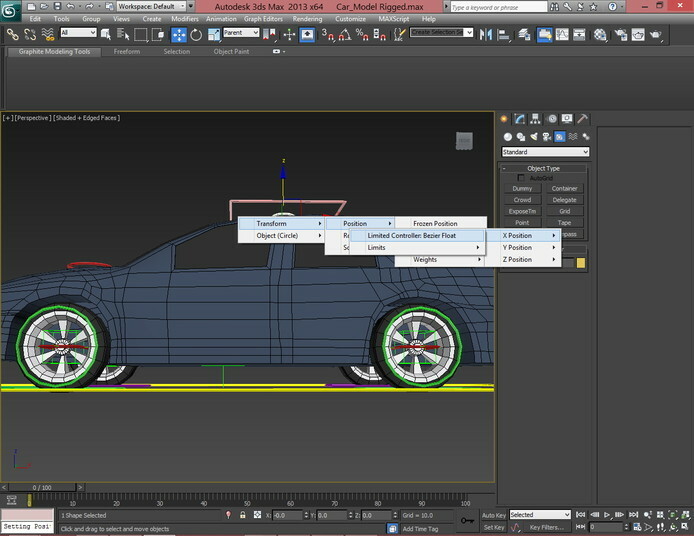 In this tutorial, we will rig a car model in 3ds max to get it ready for animation. 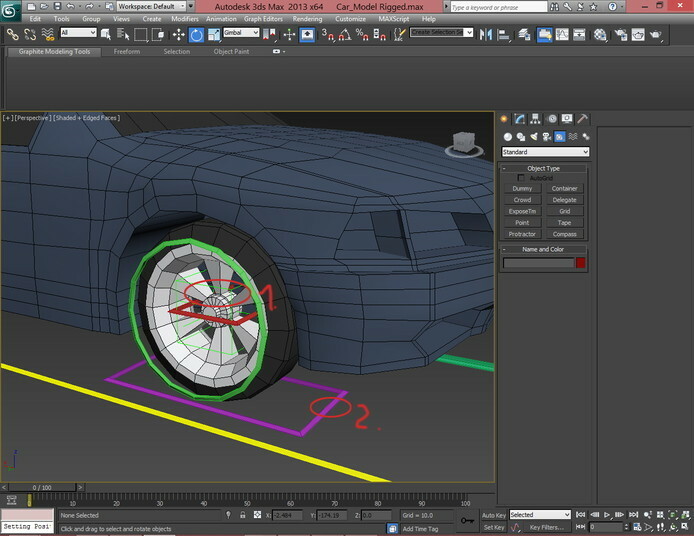 We will prepare the wheels for rotation and the body for roll, as well as other parameters, to animate the car rig. 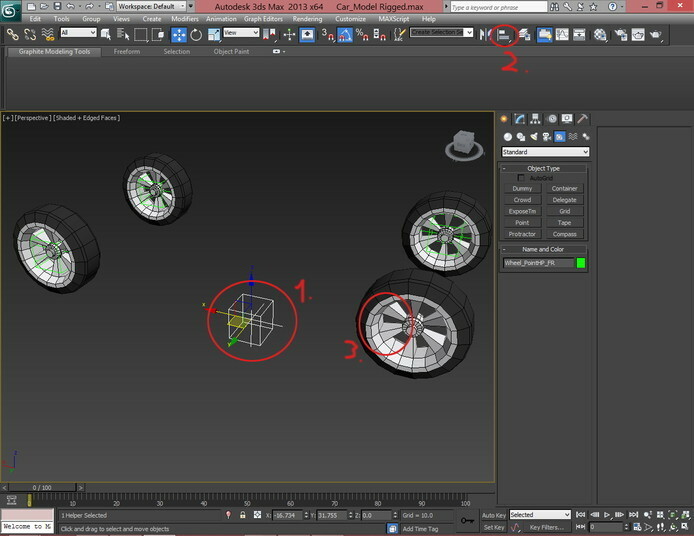 – First make sure that your objects are separated, you should have every wheel by itself and not one single 3d model. It’s good if you have the body also as a single 3D model. 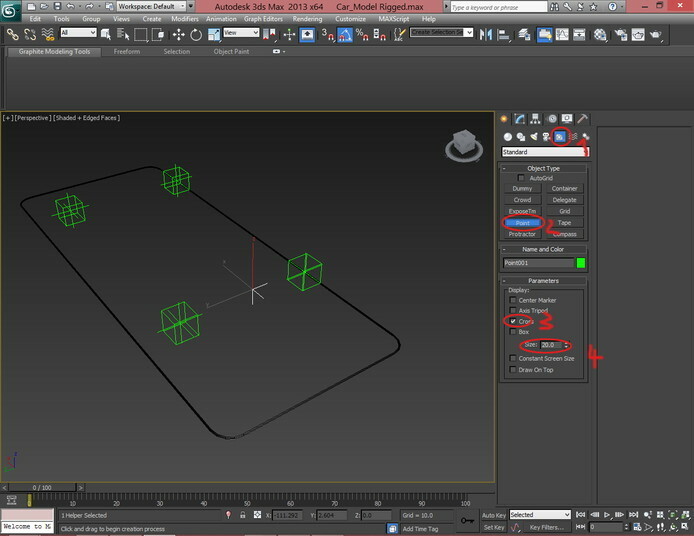 – Make sure that you are naming all the components so it will be easier to identify every single element in the scene. 3: Center To Object. 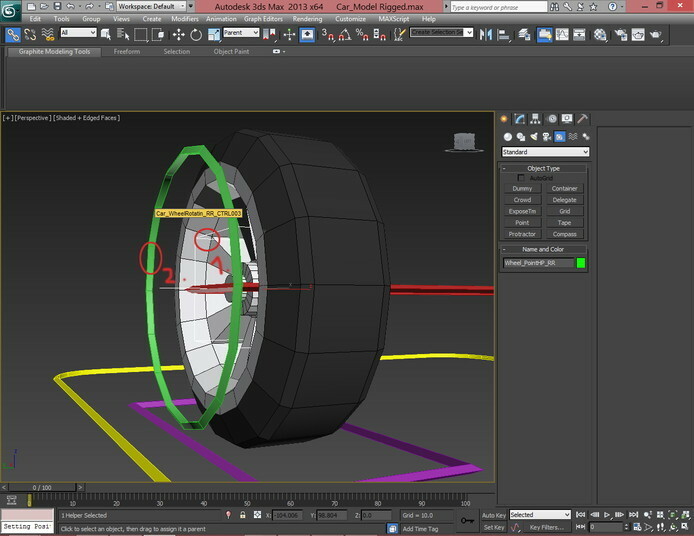 ( this will put the pivot point at the center of the wheel. 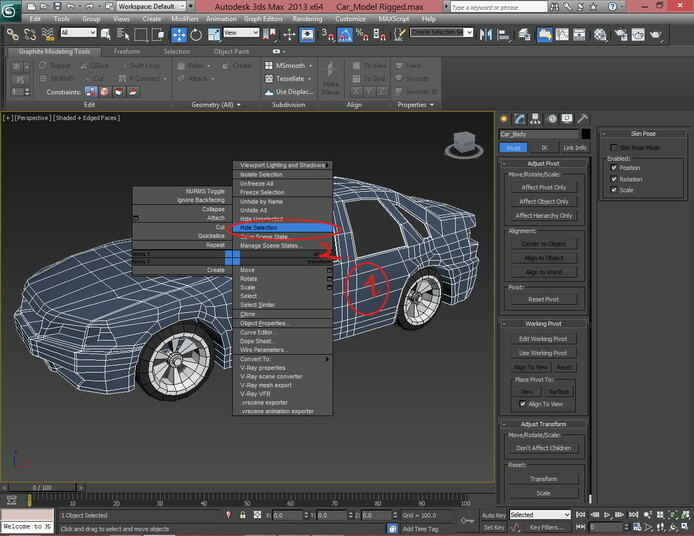 4: After you are done make sure you deselect Affect Pivot Only by clicking the button one more time. First you need to hide the body of the car and only leave the wheels. 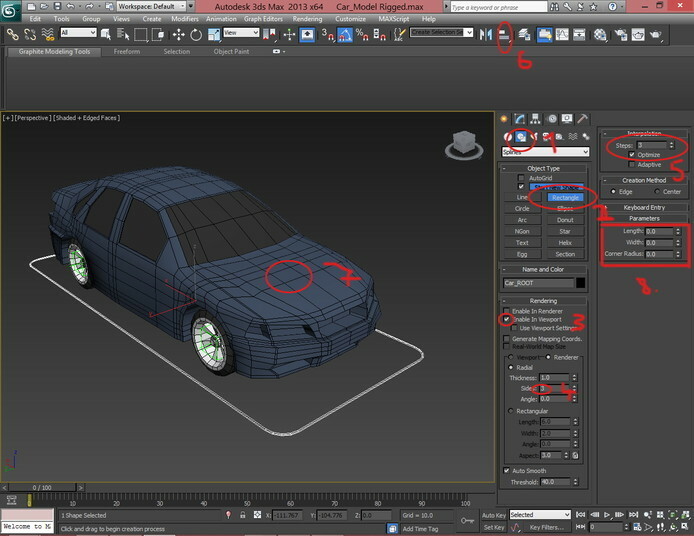 1: Click the car body. 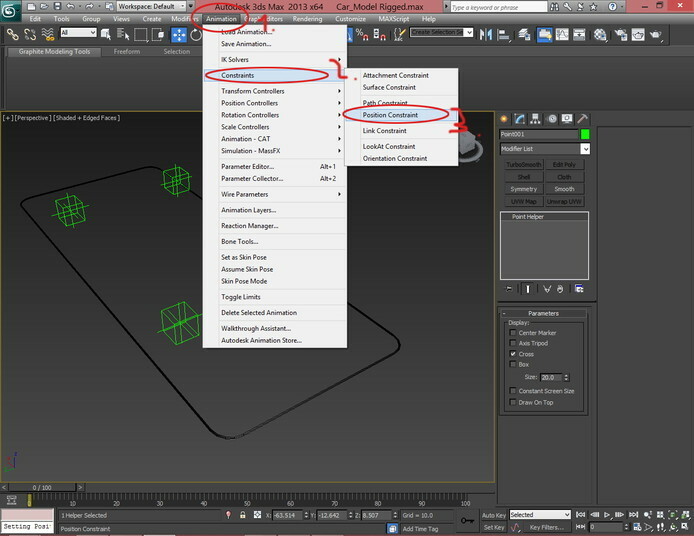 2: Right click on the body and select from the menu, Hide Selection. 1: Click on the Create tab. 2: Click on the Helpers icon. 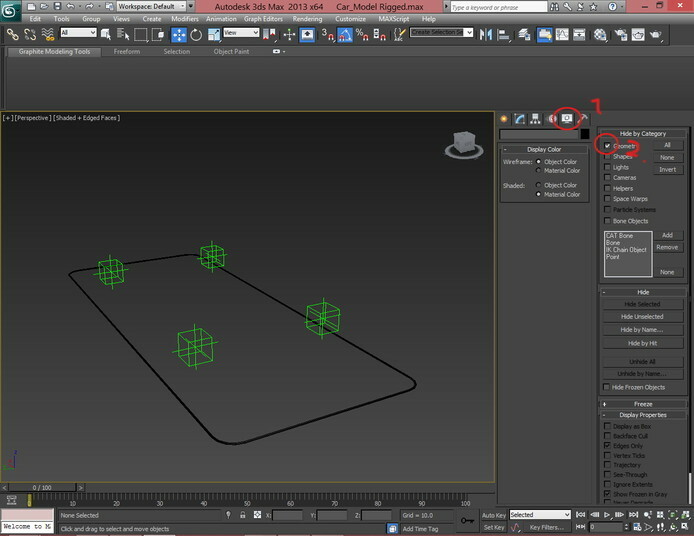 4\5: It’s for esthetics, how will the Point icon in the viewport will look like. 6: It’s the size of the helper, make it as large or as small as you like. 1: Click the Point Helper. 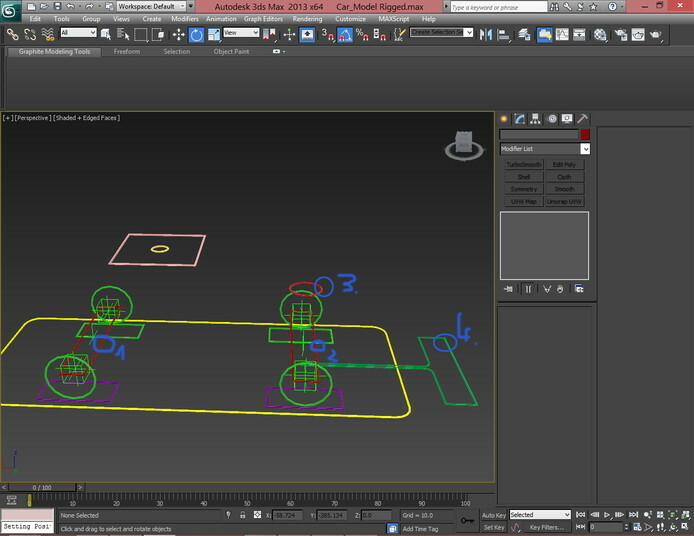 2: Press the Shift key on your keyboard while in the move mode and drag in any of the 3 axis X Y and Z. 3: Make sure the Object Tab is set to Copy. 4: After that is done the Clone Options window should pop-up, make the number of copies 3 plus the one you already have should result in 4 Point Helpers. Aligning and Renaming the Point Helpers to the wheels. 1: Select the Point Helper. 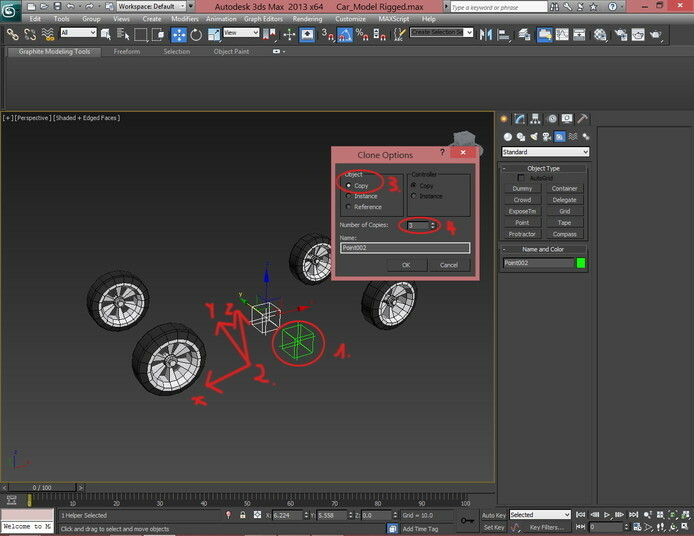 Use the Align Tool to align thePoint Helpers to the wheels. 1: Select the Point Helper for the corresponding wheel. 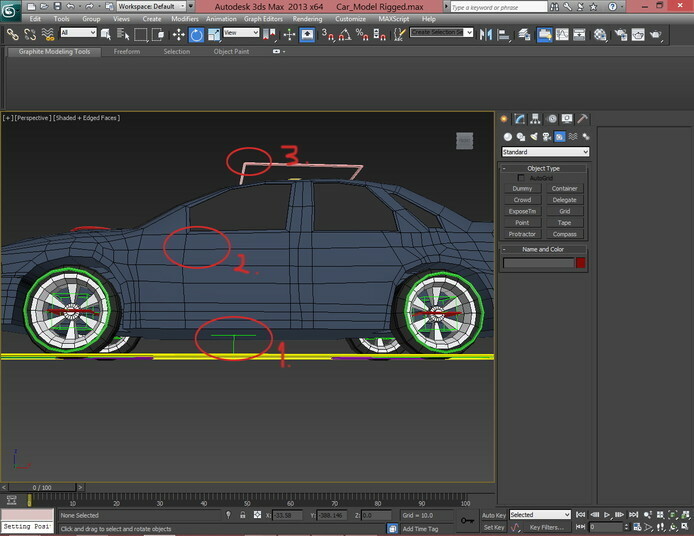 2: Push the Align button or by using a shortcut Shift + A. 1: Click on the Select And Link tool. 2: Click and don t let go of the click just drag it to 3 and after that let go of the mouse click. Do this for all the wheels. 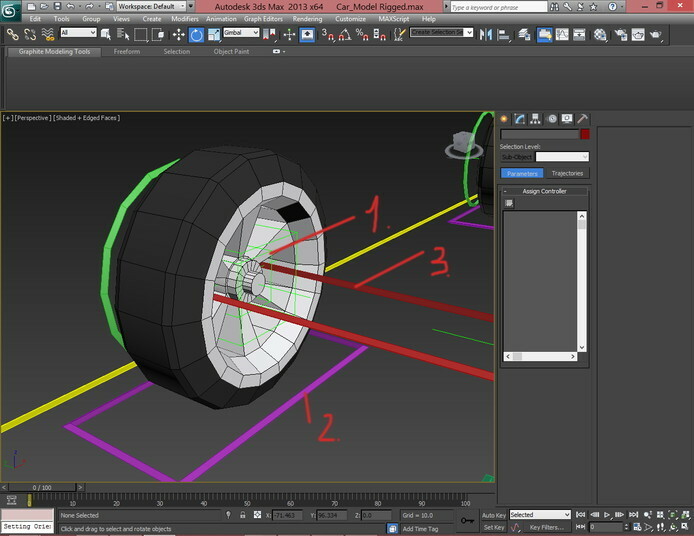 After all the wheels are linked with their specific Point Helpers you should be able to rotate the wheels using the Point Helpers, verify every wheel to make sure that the link worked. 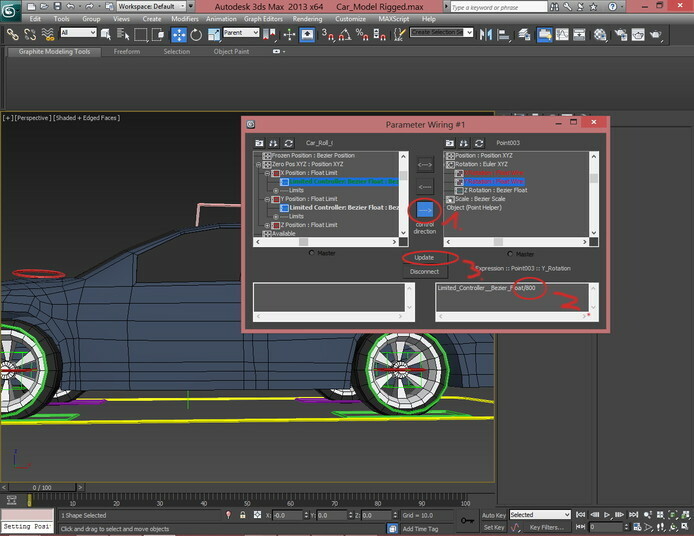 After that check the tik on Enable in Viewport, 3. 4/5 It’s good to make the shapes not to complex. 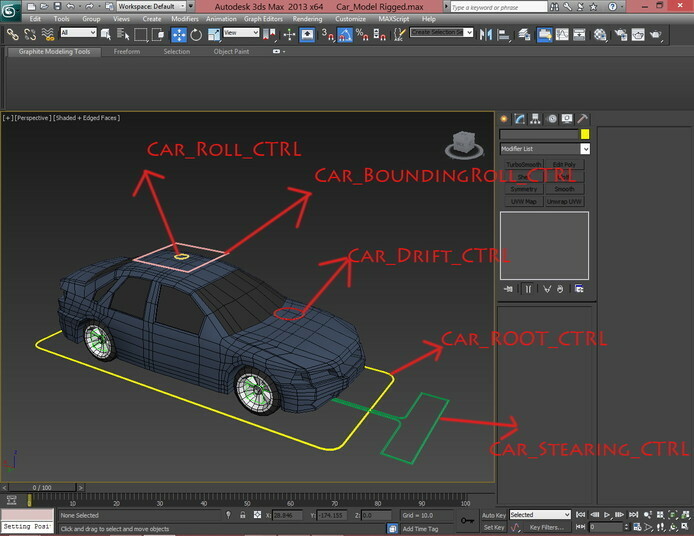 Make the Rectangle a little bigger then the car itself and align it to the body of the car using the Align Tool 6 and then clicking the car 7. 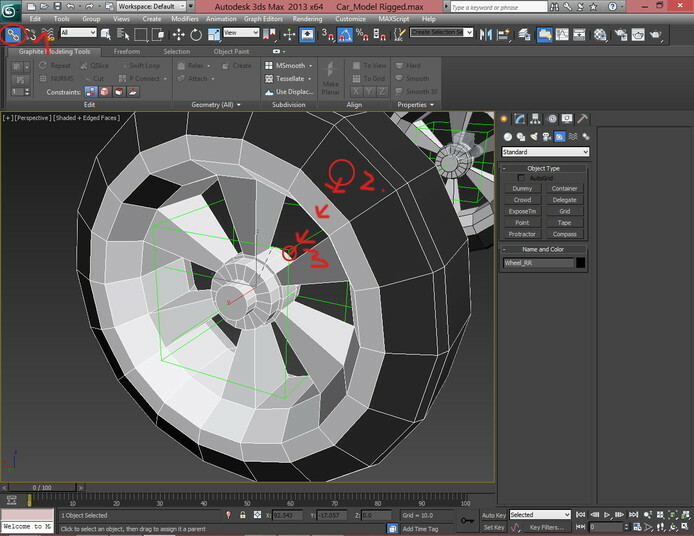 Hide only the geometry by clicking on the Display Button and then ticking on Geometry. 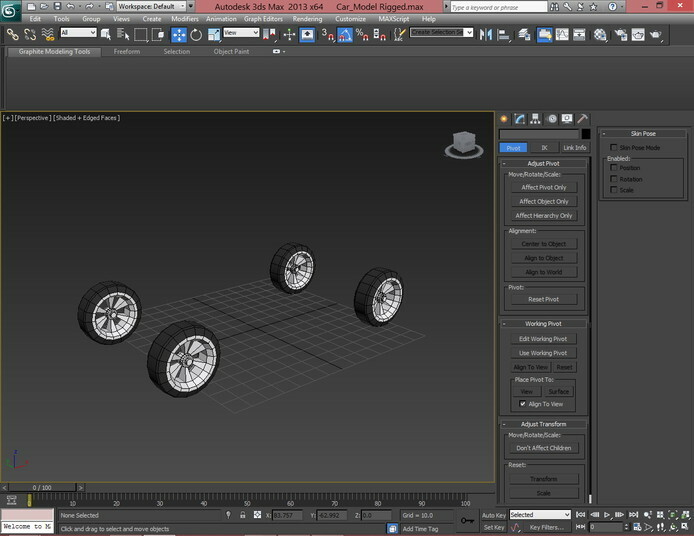 We are going to put a Point Helper in the center of the Front Wheels and one in the center of the Rear Wheels. Create a new Point Helper and uncheck the box tick when you create it. 4: Make the size smaller then the wheels Point Helpers. 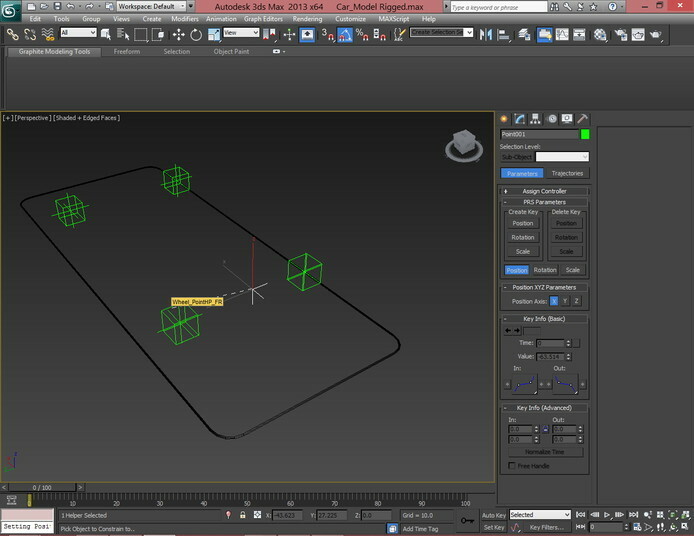 With the Point Helper selected go to the Animation 1 rollout, Constraints Position 2,Constraint 3. After that is done a dotted line should appear, using the Left click button click on the Left or Right,Point Helper. Click on Add Position Target 1, then on other Point Helper 2.Do the same procedure for the rear wheels as well. Make a shape, Examples: Arrow, Circle, Line, Etc. 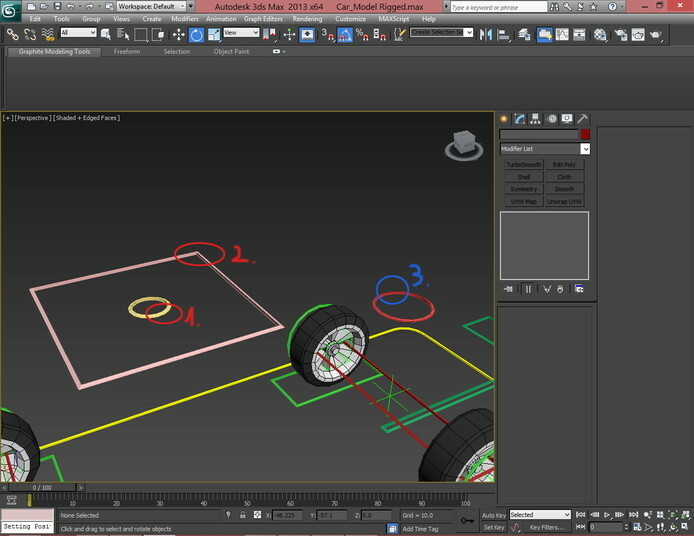 Using that shape align it to the center Point Helper of the Front wheels with the align tool, after that using Affect Pivot Only method use again the align tool to position the pivot in the same position as the Point Helper. After all that is done right click on the Z axis spinner and set it to zero, but make sure that Affect Pivot Only is disabled. (The axis spinners are located in the center bottom portion of the screen). Using the same mechanics, match the following picture. 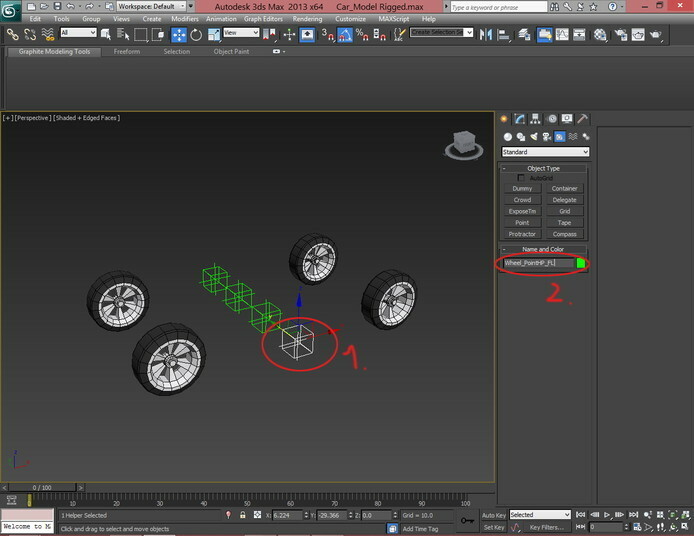 1: Align the circle to the Center Point Helper of the Front Wheels. And move it up. 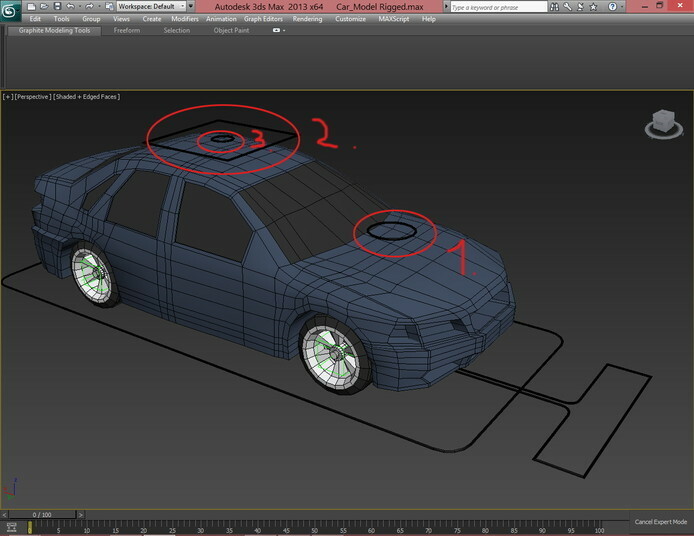 2/3: Make the circle first, and put it on the center of the car, the rectangle should be a square, and align it to the circle. You can use my naming method, or your own. Also Change the colors of the controls. Use the same mechanics, and make the rectangles and circles, aligning the accordingly. 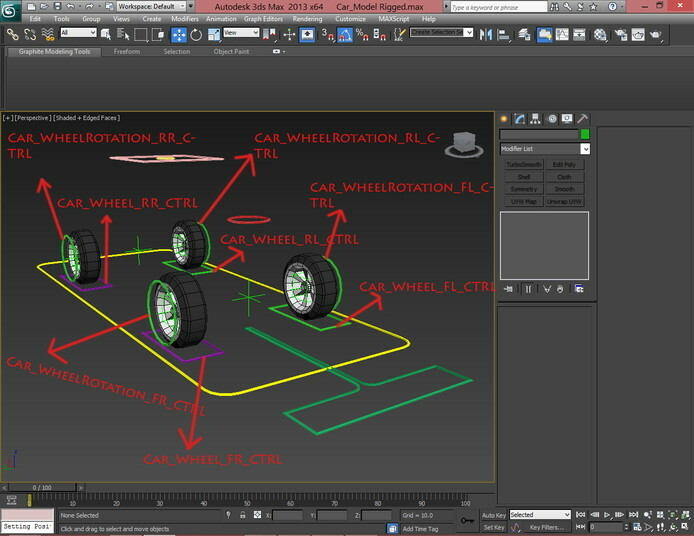 The Car_Wheel_FR_CTRL and the other parts using the same naming convention must be aligned to the Point Helper of their wheel. 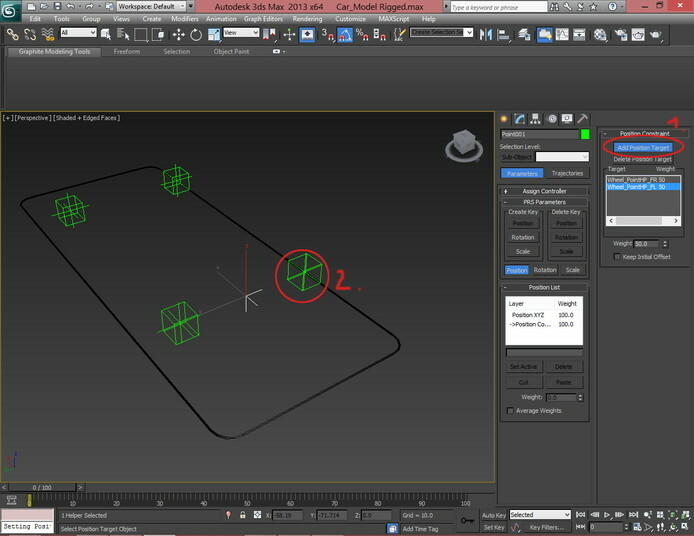 Use the align tool and align them to the center Point Helpers. First Link 1 to 2, then 2 to 3, to check if the connection is right rotate 3 and see if 1and 2 follow. After that, you need to link the two axels, Link 1 to 3, and 2 to 4. 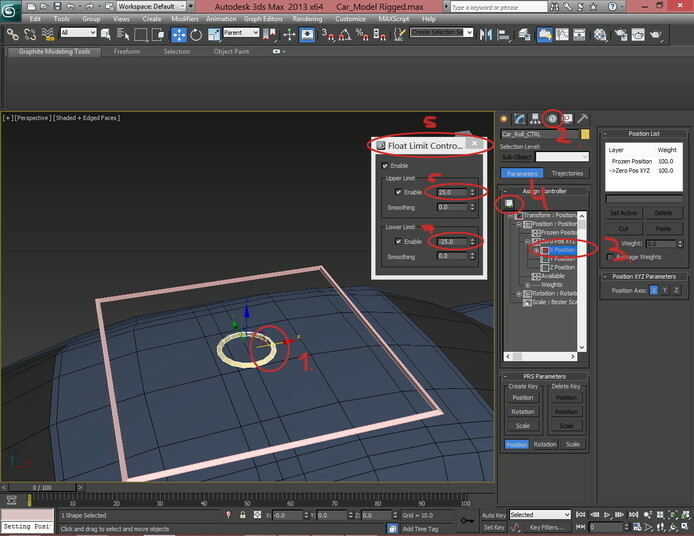 Select all the controllers and hold ALT and right click on the viewport. A window should pop-up after that hit ok.
1: Create a Point Helper and place it in the middle of the car and right when it hits the belly of the car. 3: Link 1 to 3. 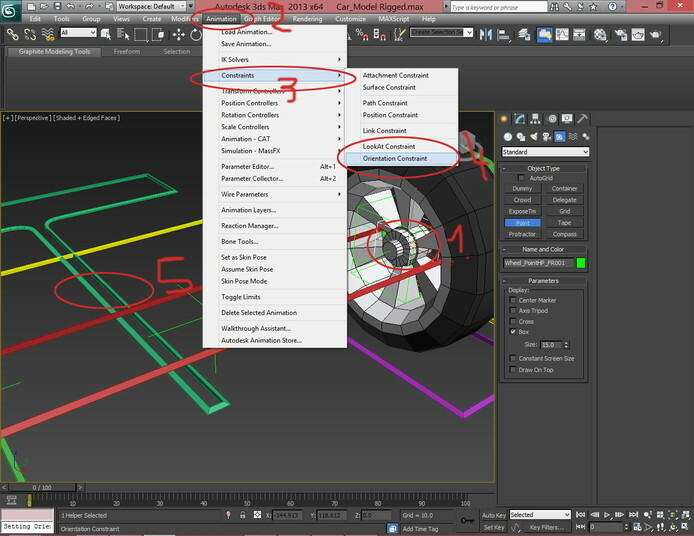 Select the inner circle 1 then go to the motion panel 2, from the Assign Controller rollout click on the X axis 3, after the click on the Assign Controller button 4, a list should pop-out choose Float Limit 5. 6\7 are the limits of the circle in the X axis type in a value and move the circle in the X direction, make it so the circle can move only until the border of the rectangle is reached. Do the same thing for the Y axis, the only thing you have to change is 3 select the Y axis. And finally for the Z axis, do the same thing only the values of 6/7 set them to 0. 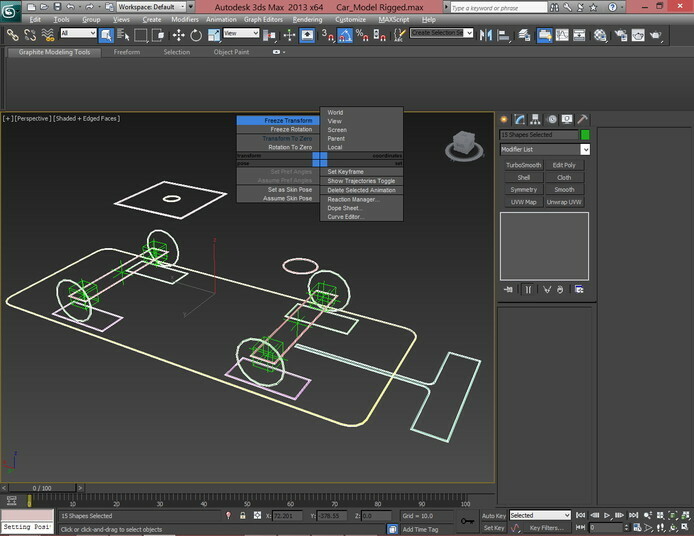 Select the center circle and right click on the viewport, a rollout menu should pop-out, click on the wire parameters button, after that click on transform, position, zero pos XYZ, X Position, and Limited Controller Bezier Float, after that a dotted line will appear with it select the middle Point Helper then click on transform, rotation, zero pos XYZ, Y rotation, and Limited Controller Bezier Float. After all this, another window will appear called Parameter Wiring. Choose the direction 1 and the click on the connect button 3 in order to make the car move less when using the roll and lean CTRL you need to divide 2 start with a value of 500 and the add or put a lower value. 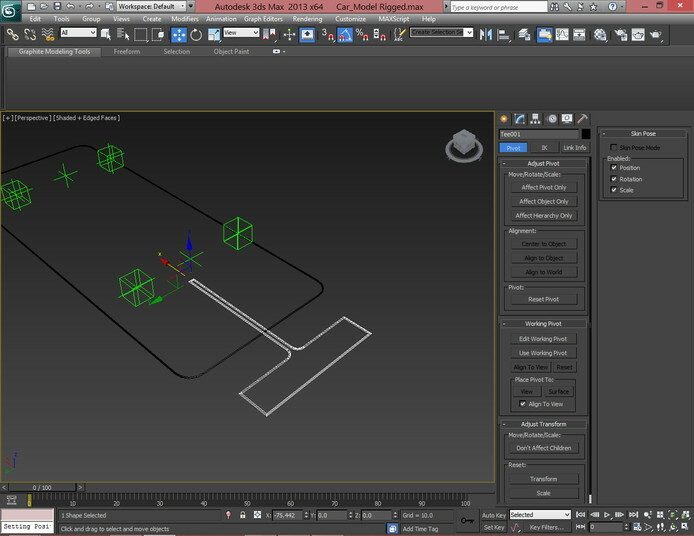 Do the same procedure for the Y position axis, just click it in the Parameter Wiring window. Also if the roll or lean parameters are reversed just put a minus (-) at the beginning of the sentence 2. 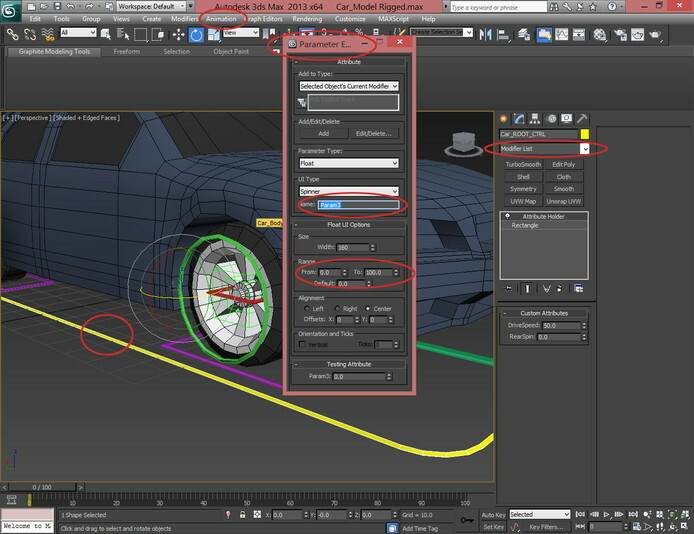 Using the link tool, link the Point Helper 1 to Car_Wheel_FR_CTRL 2, do the same for all the other parts. Link the Axel to the Drift CTRL. 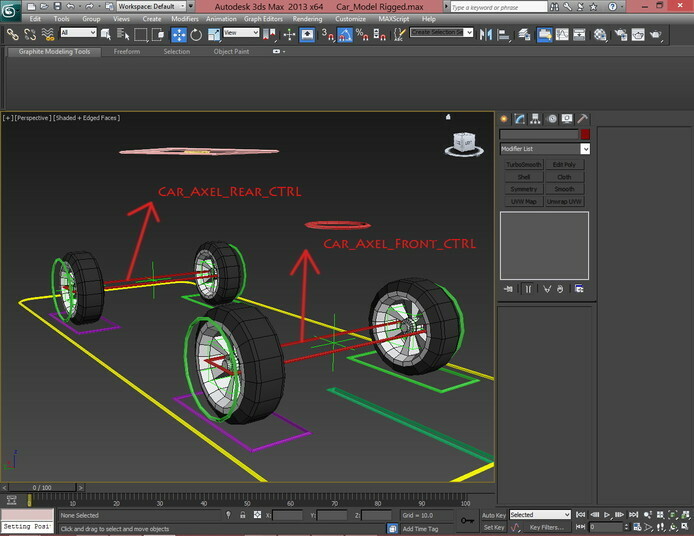 Create two Point Helpers (1) just for the front wheels and align them to each wheel. 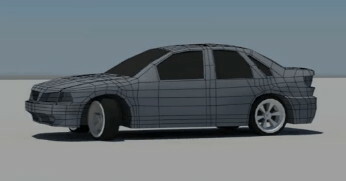 Select one of the Point Helpers then go to Animation, Constraints, Orientation Constraints, and then click on Car_Stearing_CTRL 5. Do the same for the other wheel. After that select a Point Helper again and link it (2) then link (1) to (3). Do the same thing for the other wheel. If you want to Lock Scale Rotation or Move so you are able to just move in one direction. 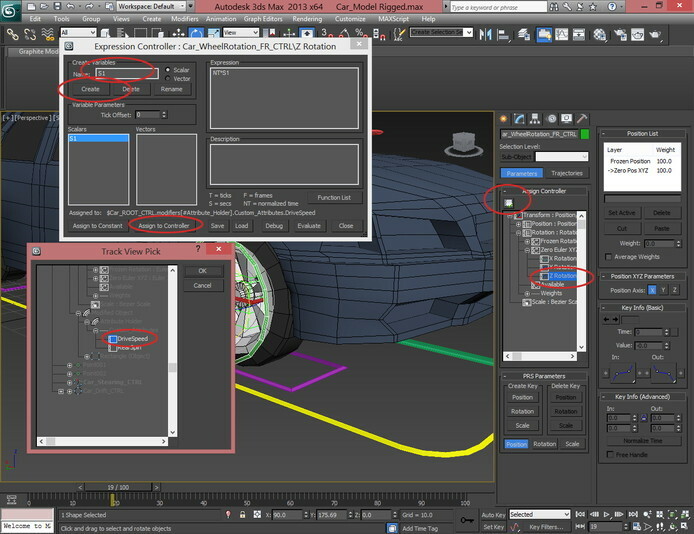 Click the ROOT, then from the modifier list choose Attribute Holder, then go to Animation and Parameter Editor. And From to -100 and To 100. Select Car_WheelRotation_FR_CTRL go to the motion panel Z Rotation, Assign Controller button and choose Expression Controller, change the name to S1 and hit create, from the Track View Pick choose DriveSpeed and hit ok. In the Expression side write NT*S1 if the wheel move in the other direction put minus -NT*S1. After all that is finished click Evaluate and the close. To verify if it worked select Car_ROOT increase the value of the Drive speed and hit play on the timeline. 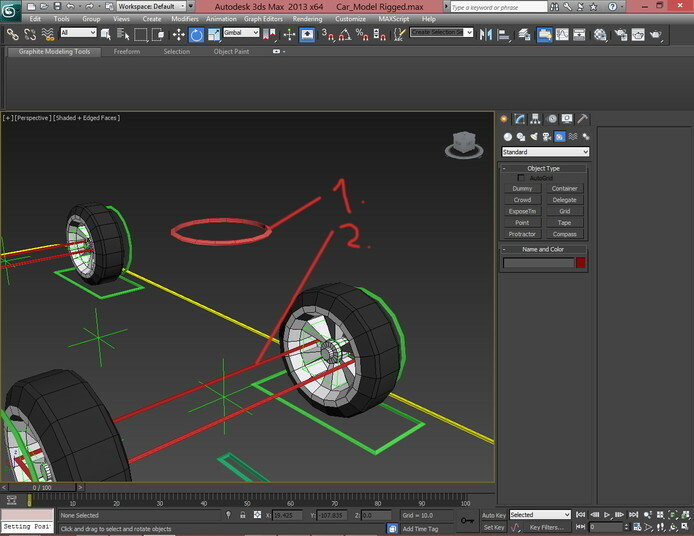 For the rear wheels do the same thing only change DriveSpeed with RearSpin in the Track View Pick.